Everything you need to know about the Class of 2021! All updates and news regarding class of 2021. Legacy - Bradley Jennings Jr. Initial Ranking for class of 2021 on 247. 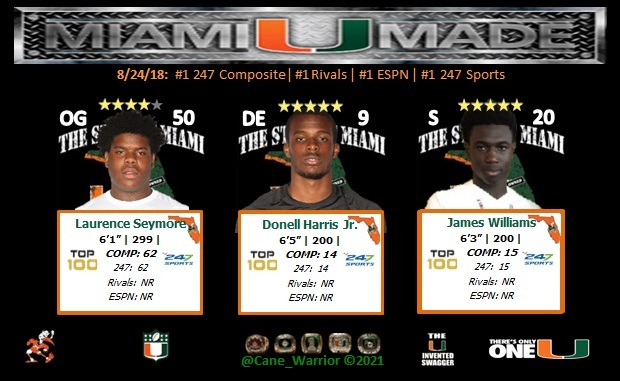 The first set of rankings for the Class of 2021 are out and all three of Miami's current pledges earned some recognition from 247Sports as Fort Lauderdale American Heritage safety James Williams, Miami Central offensive lineman Laurence Seymore and Booker T. Washington defensive end Donnell Harris all were listed inside the Top100. Williams, who played last season at Opa Locka Monsignor Pace, was graded out as a 93 by the team of 247Sports analysts and checks in at No. 15 in the rankings as did Harris, who comes in at No. 14 overall. Both prospects attended Mark Richt's annual Paradise Camp last month and impressed in drills which was also the case with Seymore, who is billed as the nation's No. 62 overall prospect. The three commitments give Miami the No. 1 ranked recruiting class per the industry-generated Composite Team Rankings for the Class of 2021 well clear of both USC and Oregon, who are the only two other schools with current 2021 public commitments. The Hurricanes also the nation's No. 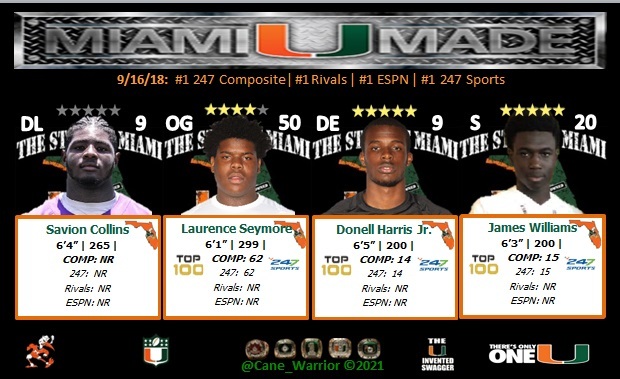 1 ranked class for the 2020 cycle. 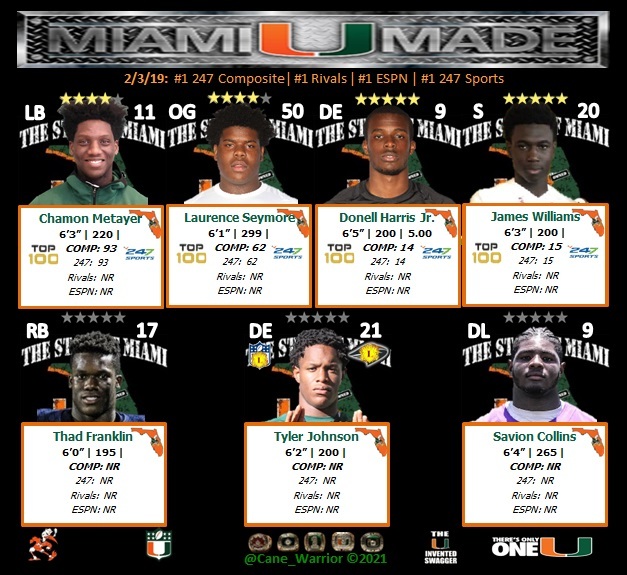 In terms of targets, a number of other current sophomores that made the Top100 already holds offers from Miami and have visited Coral Gables at some point in the past. 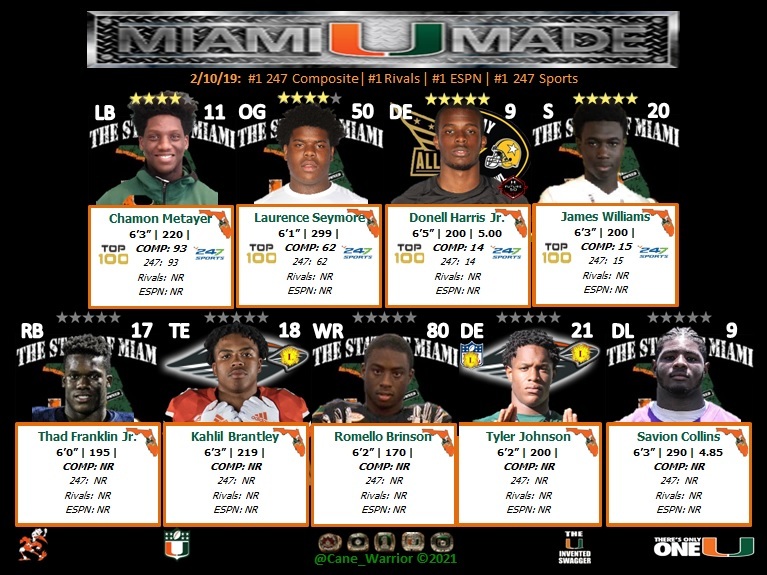 That list is headlined by Fort Lauderdale Univeristy School offensive tackle Marcus Tate, Booker T. Washington wide receiver Jacorey Brooks and Miami Palmetto cornerback Jason Marshall. It also includes Miami Jackson running back Amari Daniels, Olney (Md.) Our Lady Good Counsel offensive lineman Landon Tengwall, Tampa Jefferson tight end Gage Wilcox, Fort Lauderdale St. Thomas Aquinas defensive end Tyreak Sapp, Jacksonville Sandalwood linebacker Branden Jennings – who is the younger brother of Miami sophomore linebacker Bradley Jennings Jr. – and the Katy (Texas) offensive line duo of Hayden Conner and Bryce Foster. The Hurricanes are working to get Bogart (Ga.) Prince Avenue Christian School quarterback Brock Vandagriff on campus after offering during the spring evaluation period, as well. "He’s off and running this season," 247Sports' Barton Simmons wrote of Vandagriff, "throwing for 261 yards and three touchdowns while rushing for another 86 yards and two more scores in a week zero win." 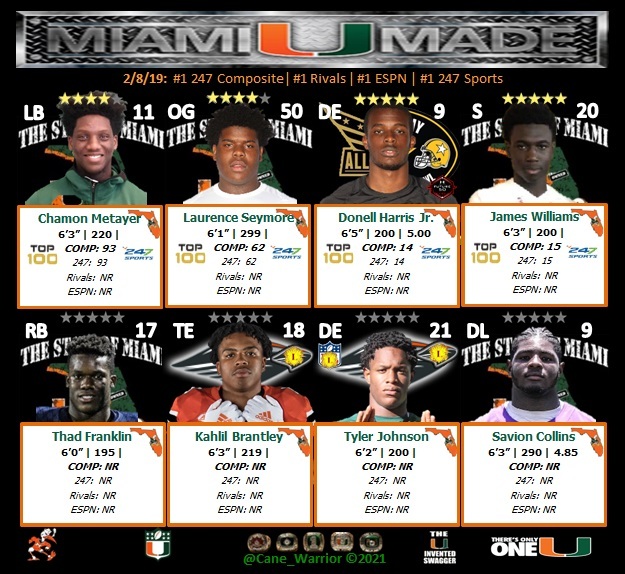 While Miami appears to be on almost every in-state prospect that was ranked on Friday, there are a few Sunshine State-based recruits that currently don't hold an offer from the Hurricanes like Ocala Vanguard defensive end Bryce Langston, Naples Palmetto athlete Kamonte Grimes, North Miami linebacker Chamon Metayer and Ocala Vanguard wide receiver Trevonte Rucker. It should be noted however that UM did send a coach to Vanguard's spring game and is currently evaluating both Langston and Rucker. "Among all of the candidates at the top of the list, perhaps the prospect with the best flash plays on freshman film is Bryce Langston," Simmons wrote while detailing who might eventually be the No. 1 prospect in the class. "We expect a big sophomore season for a kid that can bend the edge and shows get-off that would flash even in the class of 2019. He already has offers from Florida, Florida State, Arkansas and Nebraska among others." For a full breakdown of the initial 2021 rankings click, here. This BEAST by the time he arrives will be 290-300 , love the NR on him soon the CFB world will know him but it will be to late, Savion has a good heart and will give his all we got something very special here and know one rates him a "sleeper has awaken" LMAO.